How can birth be traumatic? Birth is indeed a normal part of the cycle of life. Yet birth is certainly capable of becoming our very first trauma. This trauma may be extreme, producing obvious injury. However, even when a normal birth appears to be completely trauma free, the pressures applied to the infants cranium can still cause some problems. The tiny infant is extremely resilient; able to withstand tremendous pressures as we are squeezed through the birth canal, and forced to take our first breath. This first breath infuses our tissues with life, and expands our compressed bodies to ready ourselves for the world. The infants head (occiput) plays a significant role in opening the birth canal. The normal pressures of birth cause the cranial bones to fold over one another. The membranes (meninges) and fluid (CSF) surrounding the brain act as a bouyant shock absorber. The nervous system, always attempting to maintain stability under duress, organizes around these forces. These protective mechanisms allow for maximum brain capacity and minimize brain trauma. Many of the problems commonly experienced in infancy may be caused by the forces of labor and delivery. If the compressive forces of birth are too great, the nervous system may become overwhelmed, and the skull bones may not be able to fully re-expand to their normal ease after the birth. Some births may not appear at all problematic, but can still produce substantial compression. An abnormally quick labor may prove equally overwhelming as one that is long and difficult. The newborn may become firmly imprinted by these compressive forces, producing structural imbalances and a variety of symptoms. These symptoms may range from minor variants of “normal” irritabilities to serious pathology. May be necessary to save the life of the newborn. May be necessary when the infant becomes stuck in the birth canal for extended periods of time, putting extreme pressures on their little heads. May be scheduled, for a variety of reasons. Many infants born by Cesarean Section first endure a long period of labor, with their heads lodged in the maternal pelvis. The delivering physician also may sometimes place considerable force on childs cranium, attempting to free the infant from the pelvic bowl. Though born by Cesarean Section, these infants may well suffer the ill effects of significant cranial pressure. Fluid is squeezed out of our lungs. Our central nervous system is stimulated and begins to organize. Dramatic changes take place in our circulatory system. The umbilical vessels spasm shut. Blood no longer comes from or goes to the placenta. 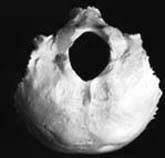 A hole in the heart (foramen ovale) closes. The lungs now infiltrate and oxygenate the blood (ductus arteriosum closes). The liver now metabolizes (ductus venosum closes). The kidneys now filter the blood. The GI tract now absorbs all nutrients. These adaptive changes must occur in a systematic and orderly manner, and place huge demands upon the newborn. When the transition to extra-uterine life is too quick, these changes in the vascular system become disorganized. Osteopathic Physicians perceive this disturbance as a “shock” or irritability that establishes itself in the nervous system of the infant; and the potential cause of many problems. Though no apparent trauma may have occured, the infant may be irritable, weak, or susceptible to infection. Osteopathic treatment eases the shock, and restores vitality; allowing the nervous system to relax and heal…so that the normal maturation processes can follow. Not all problems can be resolved, but many can be eased. And for some, Osteopathy is the answer. Like adults, each infant is constitutionally unique. Some infants seem to tolerate significant trauma from birth, without ill effect. Others are disrupted by even the slightest insults. Each of us is born with our individual sensitivities; we are all affected differently by life. What kind of results can you expect? Again, every child is different. Some children have a very rapid and complete resolution of their presenting complaints. Some children require many treatments and recover only partially. Children with developmental delays may not change immediately, but will begin to mature at a more normal rate of development. Each circumstance must be considered for its unique aspects. As a general rule, it is always best to receive treatment as close in time to the traumatic insult as possible. 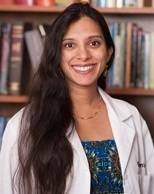 Infants may actually benefit from receiving treatment immediately after birth. The less time the traumatic forces have to establish themselves in the tissues, the easier it is to clear them. Surprisingly, even stresses that have been long imprinted into our nervous systems can still be cleared many years later. A long difficult birth produced a screaming irritable baby who could not sleep or nurse well. The diagnosis was Infantile Colic, and the parents were distraught, not only from their inability to help their suffering infant, but also from their lack of sleep. On palpatory examination an “occipital condylar compression” was discovered. After two or three treatments this child calmed, its ability to sleep and nurse improved, and harmony was restored in the home. Osteopathic Treatment may not only ease the first months of life for both parent and child, but may also produce long term benefits, as these compressions may impair other cerebral functions later in life. Infantile Colic is quite often caused by excessive pressure to the infant’s occiput at birth. The newborn’s occipital bone, located in the back of the head, is composed of 4 parts. 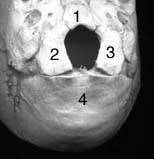 By the age of seven these 4 parts fuse to become a single bone (see diagram below). Important cranial nerves lie next to these parts, and the spinal cord passes between these parts through the foramen magnum (a “large hole”). As the infant emerges into the world, the head (passing through the bony pelvis) must flex, rotate, and extend. This unfused occiput is normally the “presenting” part and receives a complex array of forces. The 4 parts of the occiput may become twisted and compressed, causing irritation of the cranial nerves, and sometimes even irritating the spinal cord. Impaired sucking, gastric irritability, and altered muscular tone may result. Osteopathic Treatment involves carefully placing the clinician’s hands upon the posterior occiput of these distressed children, encouraging the occiput to decompress and untwist. Naturally, we evaluate and treat the entire infant, with the intention of establishing fluid continuity throughout.